Every workplace needs toilets. While most workplaces have the convenience of bathrooms right in their offices, industries that operate in remote environments like oil and gas need mobile solutions that can travel with the jobsite. Porta-potties are a cost-effective choice, but there are situations where investing in a more durable (and less odorous) option, like a shipping container-based restroom building, can improve morale and lower employee turnover. To help inform your decision, here are a few mobile bathroom basics. 1. How many toilets do I need? OSHA mandates that employers provide at least one toilet seat and one urinal per 40 employees at construction sites; many employers choose to use more to create a more convenient workplace for employees. 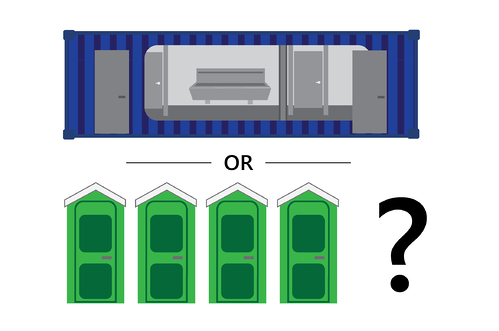 A standard 40-foot shipping container includes five toilets and four urinals. Thus, a jobsite with 160 full time employees calls for at least one shipping container restroom building or four porta-potties. 2. How long will employees be using mobile bathrooms? For short term projects, the cost-efficiency and outsourced maintenance of porta-potties is hard to beat. However, if your employees will be using the restrooms for several months or even years, the unpleasantness of porta-potties will begin to chip away at their morale. Case in point: employees appreciated clean bathrooms so much that one of our customers in the oil and gas industry purchased containerized bathrooms to prevent competitors from poaching their workers. The investment proved worthwhile; they found that employees were less likely to quit when they could use a clean, odor-free, and climate-controlled bathroom on their breaks. 3. Do you anticipate freezing weather? In mild temperatures, porta potties are reasonably easy to service, but what if your jobsite is prone to freezing temperatures? If the waste water freezes into an unsavory popsicle, cleaning porta-potties suddenly becomes an ordeal. Aside from the “ick” factor, waiting for the toilets to be fixed creates anxiety-inducing delays to your project’s schedule. If freezing weather is a concern at your jobsite, shipping container bathrooms can save you a lot of hassle because the compartment beneath the flooring that holds plumbing is insulated within the container, preventing frozen pipes. 4. Do you anticipate sweltering heat? Anyone who has attended a summer music festival can attest that no amount of blue porta potty water can quite mask the smell of raw sewage. Minimal ventilation also turns porta-potties into the worst kind of greenhouse as summer heat enters faster than it vents out. If your employees dread using the bathroom in the summer months, they’ll let you know about it or even begin to wonder if there are other job opportunities that offer better amenities. 5. Will there be extremely windy conditions? For obvious reasons, a tipped over porta-potty is unusable until cleaned. You can stake down porta-potties, but gusty storms or vandals with a terrible sense of humor always pose a risk for a tip-over. A steel container bathroom that weights over ten thousand pounds is much less likely to be rolled by a storm or person. With these considerations in mind, we hope you’re able to make a decision about your bathrooms that balances cost, efficiency and employee comfort. You can also check out our blog about ADA compliance for restroom buildings if you plan to open your restrooms to the public. If you have any additional questions about shipping container bathrooms, watch the video tour above or contact us at 877-704-0177.